3 ½ star accommodation in the city heart of Bundaberg, Queensland. #1 ranked Bundaberg motel on TripAdvisor. 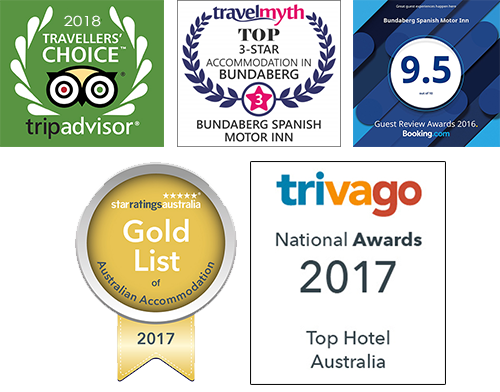 Due to our superior location the Bundaberg Spanish Motor Inn is able to provide quality 3 ½ star accommodation in the city heart with minimum traffic and pedestrian noise. All rooms are airconditioned and have Austar and Broadband connection and overlook our large pool and BBQ area. Our rooms all contain basic cooking facilities, crockery and cutlery and are serviced daily or as requested. A guest laundry is also on site for your convenience. Parking available out front for large vehicles and trucks. We trust that you will enjoy your stay! We are central to most tourist attractions in Bundaberg, close to hospitals, city centre and food outlets. Our friendly receptionist can help you with arrangements and bookings.